The 14th International Symposium on Operations Research, SOR’17, took place at Bled, Slovenia in September 27–29, 2017. In nearly hundred talks including six plenary, state-of-the-art results in classical OR topics and in several emerging areas were presented. Extended abstracts or short conference versions of papers are available in the conference proceedings (Zadnik Stirn et al. 2017) that contains 93 papers/abstracts written by 191 authors. The authors were invited to submit full papers to several journals including the Central European Journal of Operations Research. However, the call for papers was open, both encouraging the participants to submit also papers that were not presented at the conference and inviting the authors that did not attend the conference. We have received twenty submissions and after several rounds of revisions fourteen papers were accepted for publication in this special issue. The accepted papers cover well the variety of relevant topics, from theoretical foundations of OR to a number of applications. Linear programming is a classical approach in OR that provides new research challenges until today. The paper written by Garajová et al. (2018) considers the interval linear programming that is a tool when the optimization problems are to be solved under interval-valued uncertainty. Tavakoli and Klavžar (2019) address a discrete optimization problem studying global defensive k-alliances. The problem arises in different areas including national defence, RNA studies and fault-tolerant computing. Bipolar method, one of the multiple criteria decision analysis methods is improved and illustrated by numerical examples in the paper of Trzaskalik et al. (2019). 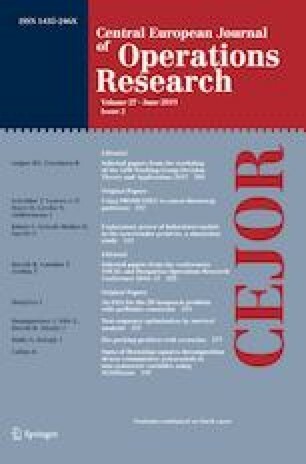 Further studies of decision support methodologies include integrating DEMATEL with the analytic network process (ANP) (Kadoič et al. 2018), an application of ANP (Ligardo-Herrera et al. 2018), and a comparison of structural equation modelling (SEM) with the two-step method integrating SEM with artificial neural network approach (Sternad Zabukovšek et al. 2018). A number of contributions is focused on more specific applications that are essential for our future and current welfare. Emergency stations allocation is considered by Janošikova et al. (2019) who compare several median-type location models. Ecology, including fresh water source protection and sustainable waste manipulation are nowadays at the top priority in governmental policies, and it is important that the action on the ground is supported by relevant research. Water management investment projects are regarded by Brelih et al. (2018). Illegal waste dump-surface modelling may be detected by advanced geodetic field measurements, as shown in the study of Pavlovčič Prešeren et al. (2018). However, nothing would be possible without efficient production. Jordan et al. (2019) propose a two step portfolio analysis which improves the classical portfolio analysis and is necessary when short delivery times of high quality products are a must for the companies to survive in the global market. On the other hand, internal innovation inputs are shown to have both local and regional positive effects on economic development (Furkova 2018). Another important factor that may improve the labor productivity are direct foreign investments as suggested by Jakšić et al. (2018). Last but not least, education is among the important issues that are discussed in the OR atmosphere. Čampelj et al. (2018) report how decision making methodology DEX was used for evalution of information and communication technologies in some schools in Slovenia. Bokal and Steinbacher (2019) propose a task based model for understanding the motivation of students. The publications in this special issue demonstrate that operations research continues to be a very diverse and dynamic area, where state of the art quantitative methods are employed to solve real life problems. Creating models for real life problems, solving them, validating the results and further enhancements of the models is a process that results in a “digital twin” of the problem, which gives much better understanding of the initial problem and enables better decisions. Dissemination of successful stories provided by operations research among the practitioners is a crucial task that bridges the gap between the theory and the practices and eventually contributes to better science and better economy. We hope that further research, and its dissemination at the SOR conferences, as well as conferences organized by other OR societies will continue to contribute to these goals in the future.